1. Light the barbecue. While it is heating up, toast the coriander seeds for 2 minutes in a medium-hot frying pan and grind into a powder using a spice grinder or pestle and mortar. Pass through a sieve and discard the husks. 2. In a large bowl, mix together the powdered coriander seeds, beef and pork mince, cloves, nutmeg, salt, pepper and breadcrumbs until all the ingredients are thoroughly incorporated. Divide the mixture into 6 balls, each approximately 200g in weight. 3. Between the palms of your hands, gently flatten each ball into a burger with approximately the same diameter as the bap. 4. When the charcoal has reached the right heat, place the burgers directly above the charcoal, flipping them over every 15 - 20 seconds until the meat is cooked to your liking. Just before the burgers are cooked, add a slice of cheese to each one and, if your barbecue has a lid, close it for 1 minute to melt the cheese. If your barbecue doesn’t have a lid, place the cheesetopped burgers under the grill for 1 minute or until the cheese melts. At the same time, gently toast the baps on the barbecue. 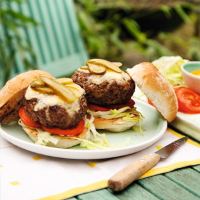 Serve the burgers in the toasted baps with your choice of garnishes and condiments.